Fontana Regional Library’s Read Local Book Fair was named the Best Service Innovation Project for a public library of its size across the state of North Carolina for the fiscal year 2014-2015. The award was presented to the library director, Karen Wallace, at the annual banquet of the North Carolina Public Library Directors Association on December 3, 2015. The November 2014 Read Local Book Fair was designed to introduce the reading public to some of the local authors in Macon County. It also supported the “shop local” efforts of independently owned businesses in this rural part of western North Carolina in the weeks leading up to the holiday season. An additional highlight was the sense of connection it gave the writers, and the opportunity they had to network with, and learn from, each other and introduce their books to local readers. 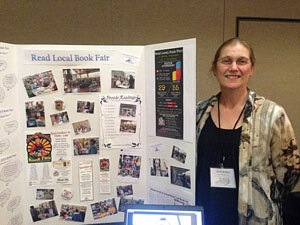 A partnership with the local independent bookstore was critical to the success of the Book Fair. Both authors and the public praised the Fair, which was repeated in November 2015 and expanded to include a parallel event at the Jackson County Public Library in Sylva featuring Jackson County authors. Plans for the 2016 Book Fair are already underway, including consideration of the Marianna Black Library in Swain County as a third location. Innovative library service projects from around the state were judged on their Originality; Ability to be Replicated; Involvement with Other Community Organizations; Relationship to the Library’s Mission, Effectiveness of Publicity; and their Results to Cost Ratio. Fontana Regional Library’s Read Local Book Fair was considered the best in its class. The North Carolina Public Library Directors Association is a 501(c)4 organization made up of the directors of the state’s eighty public libraries. Its mission is to share professional knowledge and experience for the good of all members, to serve as advocates for public libraries with the state legislature, to give voice to the aspirations of the public library community, and to serve as the primary liaison between the state library agency and the public libraries.